Set against the backdrop of the historic Halifax waterfront, the Halifax Oyster Festival brings together nearly two dozen Maritime oyster farmers with local brewers, wine makers, and distillers in a truly unforgettable, farm-to-table, food and drink experience. 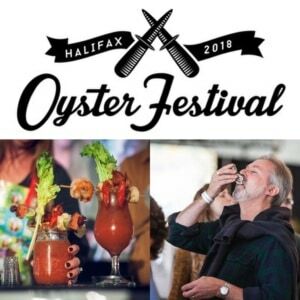 The 4th annual Halifax Oyster Festival is set for Sept. 28-29, 2018, featuring the Nova Scotia Oyster Shucking Competition, both amateur and professional Caesar-making contests, and a sampling of local fare ranging from poutine to chowder and mussels. Our 2017 event featured Sober Island Brewing’s Oyster Stout, P.E.I.’s Gahan Brewery, cocktails from Nova Scotia Spirit Co., and a VIP experience anchored by gourmet tasting plates conjured by chef Alexandre Jolin from The Barrington Steakhouse and Oyster Bar, paired with Benjamin Bridge’s iconic sparkling white Nova 7. Nova Scotia offers an unexpected mecca for the traveler looking for authentic culinary experiences, with much to see and taste within an hour’s drive of Halifax, including the award-winning Annapolis Valley wine region bordering the Bay of Fundy. Tickets for our Friday night or Saturday tasting sessions are on sale now.